Love watermelon? Who doesn’t?! 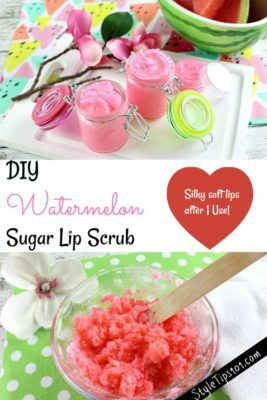 And that’s why when we came upon this DIY watermelon lip scrub recipe we were ALL over it! Made with just a few simple ingredients that will exfoliate and soften lips, this watermelon lip scrub is SUPER easy to make and smells just like your favorite fruit! This bright, refreshing lip scrub is the perfect spring pick-me-up and will also make a really cute gift! This recipe will yield about 1/3 cup of watermelon lip scrub, which is about 3 lip balm containers! 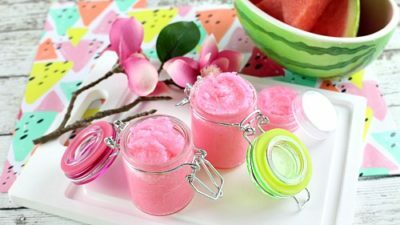 The watermelon flavoring will give the lip scrub a light pink tint, but if you’d like to make it even more pink, go ahead and add a drop or two of pink food coloring or beet juice. Transfer to a clean, airtight container and store for up to 3 months. Wet lips with water and apply a small amount of the watermelon lip scrub to your lips. Gently, and in slow, circular motions, scrub onto lips and enjoy the awesome, refreshing scent of watermelon. The sugar in this recipe will gently exfoliate the skin, while coconut oil and vitamin E oil will moisturize and protect lips.